My return visit to the turtle camp after almost five years was everything I expected. Although the camp was not at the location that I volunteered at as a gap year student five years ago, the camp at Tecoman has been up and running for almost four years now. As we entered the camp, surrounded by fields of palm trees and the sound of crashing waves I had the strangest sense of de-ja vu. This time however, was going to be different as I am now a member of staff. Having lived in Guadalajara for almost a month now I had yet to experience the sea again, but stepping out of the truck and being faced with a stunning stretch of dark sand contrasted with a beautiful sunset and immense waves, I felt in a strange sense as though I had never left. After our inductions and introductions to the members of staff we had an hour of sunlight left to explore and I was immediately impressed with the quality and layout of the camp infrastructure. The two corrals, shower and bathroom facilities, kitchen and equipment buildings were well built and attractive and the sleeping areas and communal space for volunteers were well laid out and practical. On my first evening I was on first shift for patrolling and within seconds of settling myself on the quad bike I felt a mixture of anticipation. I had forgotten how beautiful a beach can be in the moonlight and although we didn’t see any adult turtles we did find three nests which I was proud to have found one of. 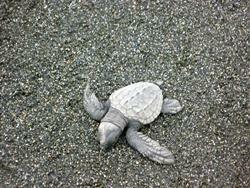 I was present to release three batches of baby Olive Ridley hatchlings both at night and during the morning. 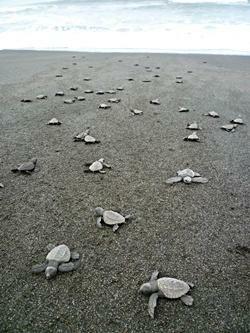 Nothing comes close to the feeling of setting the hatchlings off into the waves and truly giving something back to the environment. The hatchlings were just as I had remembered them and I’ll keep my fingers crossed that during my next visit I will get to see baby Leatherbacks and Black turtles. During my short visit to the camp I was involved in camp duties, the release of hatchlings, a night patrol shift and, on my second day, a trip out onto the lagoon to study the local wildlife. This new addition to the project is of obvious importance and will hugely contribute to the attraction of the project. I had never seen so much bird life and other wildlife in such a concentrated area and with the expert help of Oliver and Roberto the boat trip was unforgettable. I always think that memorable experiences can never be topped but as so often is the case, this trip proved me wrong.